1. 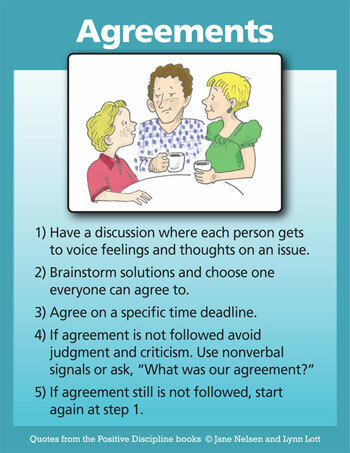 Sit down together during a calm time (not at the time of conflict) and have a respectful discussion about the issue that requires an agreement. It is important to wait until everyone has calmed down before a rational discussion can be achieved. 2. During the discussion time, be sure that everyone has an opportunity to share his or her thoughts and feelings about the issue. Interruptions are not allowed when someone is sharing. Some families use a three minute sand flow timer. The person who is sharing can have the whole three minutes, or can stop before his or her time is up by saying so. The person or people listening are not allowed to defend, explain, or give their opinion until it is their turn. 3. Brainstorming comes only after everyone has had a chance to share. Make brainstorming fun where any suggestion is written down—no matter how wild or crazy. Do not give opinions about brainstorm ideas. This is not the time for discussion. Just get lots of ideas written down on paper. It is a good idea to focus on solutions. 5. Hopefully their will be some suggestions left. Choose one that everyone can agree to. 6. If appropriate, choose an exact time for completion of the agreement. For example, if your daughter agreed to mow the lawn, negotiate for a time that works for both of you. 7. When an agreement isn’t kept, respectfully ask, “What was our agreement?” Read on to discover why this may be necessary.